The IS-1 is a Rank III Soviet heavy tank with a battle rating of 5.3. It was introduced during the closed beta testing for Ground Forces before Update 1.41. It is the first unlockable IS series heavy tank. Operational and visual characteristics of the IS-1 retain the visual and operational similarities to the previous KV line of heavy tanks of which it is descended from. Players experienced in operating previous models of the KV series of tanks should have little to no difficulty in adjusting to this vehicle. Unlike its predecessor, the IS series of tanks are designed with a priority of engaging enemy armoured vehicles in mind and as such, come with increased yet more sloped armour than its KV predecessors whilst sporting a slightly longer chassis, more powerful 85mm D-5T gun and a larger, rounded turret. Suspension wheels are 20 mm thick and tracks are 30 mm thick. Though the front plate is 120 mm thick, it is not very sloped in comparison to the front glacis. Despite front glacis 60 mm thickness, slope effect up to ~130 mm and ricochet chances improves protection. Ammo racks of the IS-1. As the tank's design purpose suggests, the IS-1 is a heavy tank built with an emphasis of engaging hostile armoured vehicles as well as a break-through tank. The tanks heavy armour has similar properties of its previous KV-1 line, but the introduction of sloped armour on the front plate and turret mantlet can allow operators to withstand a significant amount of damage at most ranges, especially when armour is angled. The fast reload speed of the 85mm gun (on par with its T-34 and KV-85 mounted sisters) also allows it to be an effective brawler in close quarters combat against multiple targets. When encountering more well protected targets, the IS tank (although equipped with the same type of cannon) has access to APCR rounds to better deal with more heavier opponents, something the KV and T-34 models lack. Although classified as a heavy tank and an upgraded improved design over the KV predecessor, the tank is not invulnerable. The vehicle's armour thickness is quite effective in its class. Unlike its Tiger rivals and KV predecessors the IS-1 has better or equal thickness armour on almost all sides except the rear hull and is sloped increasing the chance of ricochet and damage reduction when struck. Of note is the large turret and exposed turret mount which is commonly targeted at engaging hostile vehicles from the front. Armaments and ammunition options aside, the IS tank can perform similarly if not better at engaging targets than the common T-34, albeit with more satisfactory armour protection, able to allow users to lead a charge from the front with relative confidence or provide fire support from the sides or rear. This tank is quite sufficient in holding its own on the battlefield in many situations where more lighter vehicle cannot. Another significant note of this vehicle is its considerably fast reverse rate, the highest of its Rank and Battle-Rating for the nation's faction, topping at 17 km/h. 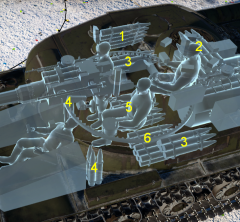 During situations where close-quarters engagement is expected, an unorthodox strategy can be utilized when the operator of the IS tank re-positions the vehicle 90 degrees and drive in reverse towards the enemy. By driving in reverse with the rear facing the opposition, the engine blocks make a crude yet somewhat effective shield and protecting the more delicate crew. As the fuel tanks are mostly stored at the front on the left and right side of the driver's station, the risk of fire and fuel-tank explosion is reduced significantly (but not completely eliminated) and thus, the tank is able to resist even the most powerful of shots. Be aware that more experienced players may attempt to instead fire at the more exposed turret of the IS tank and instantly knocking out the crew with a common APHE penetrating shell. When engaging the common Tiger tank and Panzer IV models, each of these vehicles retain the design flaw of 90 degree flat armour plates on the front and sides of each respective vehicle. The IS-1's 85mm cannon should have little no difficulty in penetrating this and destroying the opposition's vehicle in a single shot if this weakness is exploited. The Panther and occasional Tiger II models are more considerably dangerous and difficult to dispatch when encountering them head-on due to the thicker and sloped armour of which the 85mm cannon of the IS-1 cannot penetrate. In head-on engagements, operators of this vehicle should note to precisely target the right and left side turret mantlet of each respective vehicles instead. Time expended in attempting to find a penetration confirmation indication on the cross-hair when inspecting the sloped front plate is time wasted and instead, should be diverted on precise targeting of the mantlet. Other more common tanks such as opposition USSR KV, IS and T-34 models are usually less of a concern than the common Panther tank, as most of these respective tanks also inherit the weakness of somewhat slopped frontal chassis and turret armour which can be easily penetrated even from significant distances with a precise aim. Re-positioning of fuel tanks reducing chances of fires. Player skill compatibility between older and newer KV and IS models. Poor gun depression (common trait in all USSR tanks). Difficult to angle armour due to weaker hull cheeks. The start of the development for a new heavy tank in the Red Army came from the many criticism of their current heavy tank, the KV-1. The KV-1 had poor mobility and a lack of firepower and armour advantage over the standard T-34, plus the KV-1 was more expensive to produce for no real advantage. Attempts to remedy this problem produced the KV-1S and the KV-85, which tried to make the KV-1 more mobile, more ergonomic, and have better firepower. 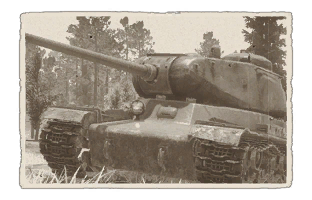 Though they were improvements over the original KV-1 design, it was already determined that the KV-1 designs are to be replaced by a new heavy tank design and the newer KV-1 developments were to be interim designs until the heavy tank development is complete. The heavy tank project, code named Object 237, had its basis from the cancelled KV-13 program and was restarted from the discovery of the Tiger I after one was captured in Leningrad, thus it began in January 1943. However, despite the ensuing development, the intense tank fighting in 1943 in Kursk and ensuing operations forced the Object 237 to see action early, with its turret used on the KV-85, which itself was built atop the KV-1S hull. The turret mounted the new 85 mm D-5T gun and would be a great firepower advantage enjoyed by the Soviet tank forces as it gave them a heavy tank with a comparable firepower to the Tiger I's 88 mm cannon. 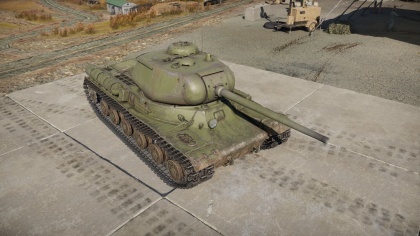 In the end of 1943, the Object 237 project was finished and was accepted into service as the IS-85, or the IS-1, named after Iosef (Joseph) Stalin, the current leader of the Soviet Union during World War II. The IS-1 began to be delivered in October 1943 and went into service in the same month. The IS-1 stayed in service until January 1944, when its production also ended with about 200 units produced. The IS-1, like the KV-85 before it, was a great assist to the Soviet tank forces, giving them a heavily armoured tank with a great 85 mm gun that could defeat most of the German tanks in service except their heaviest ones such as the Tiger I and the Panther tanks. The IS-1 were issued to Guards Heavy Tank Regiments for service, most notably the 1st, 8th, and 13th Guards Heavy Tank Regiments which saw service in Ukraine and Slovakia. The IS-1 had a short-lived production due to advances in Soviet tank technology. Their standard T-34 medium tanks were upgraded with the same 85 mm gun on the IS-1 into the T-34-85. The lack of firepower advantage the IS-1 now presented due to this upgrade prompted an up gunning of the IS tank with a much bigger gun. After further development in late 1943, the IS-1 evolved into the IS-2, which has the larger and much more powerful 122 mm A-19 gun. This page was last edited on 11 January 2019, at 23:37.